Since its launch in 2009, Ubisoft’s Just Dance 2015 game series has kept players moving and grooving. Just Dance 2015 represents the sixth installment in the active game series where players keep to the beat and closely follow the colorful silhouette dancers. This game keeps on giving more content and unlockables as players dance through the tracks by themselves or with up to eight friends plus extra fitness and karaoke gameplay. Developed by Ubisoft Paris/Millan and published by Ubisoft, Just Dance 2015 expand the controller options to three to get more players involved. Music track choice is very good so most tracks will warrants additional plays. Developers also offer some nice enhancements. Progression to unlock avatars and animations adds some variety as does the sing along karaoke option. Calorie workouts and the community remix option, which features other player performances worked into the song (players appear instead of avatars), boost the replay value as well. Performance is evaluated in points with a generic text grade (e.g. “Perfect” or “OK”) and the technical performance works smoothly expect for the occasional snafu. The progression is worth it as players can unlock various items to enhance the experience. Initially players are presented with an unavoidable challenge (unless you restart) to get oriented. Players are not overwhelmed with various modes and instead have multiple ways to re-experience the same songs through two methods – online play and competitive play. Modes include Trio, Dance Mashup, World Dancefloor, and Just Dance VIP featuring recording capabilities that make performances into playable videos. On the technical side, it is very important to optimize the PlayStation camera for camera control and web connectivity for online play. This first camera option is the only hands free choice and requires strong lighting for optimal performance. Players still have the PlayStation Move controller option as well, which seemed to be a little more accurate for my kids, but didn’t make much of a difference for the adults. 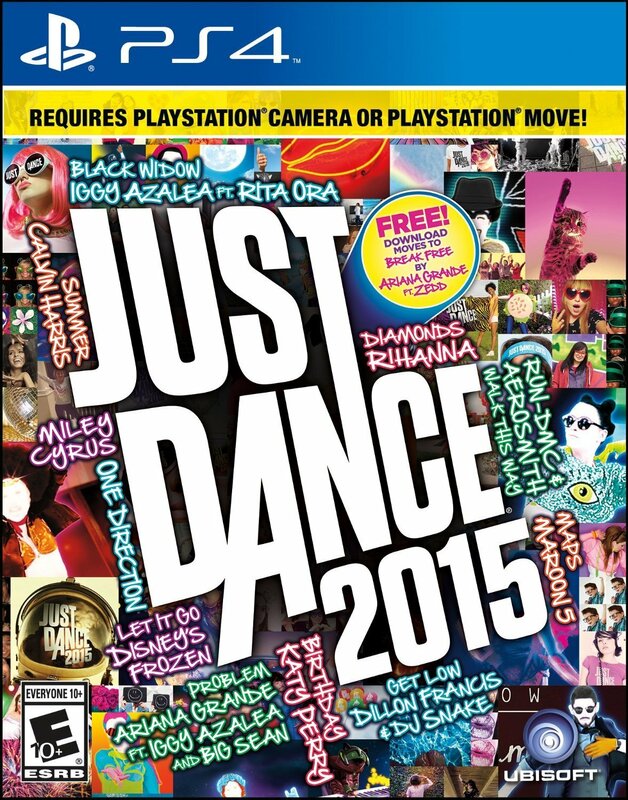 Would assume a next-gen console version of Just Dance Kids is on the way. Don’t have the camera or PS Move? Try the third and most interesting control option – the Just Dance 2015 Motion Controller App (available on most smartphones) works like the PS Move to track player movements. The multiplayer gameplay is entertaining for participants and viewers. It’s great all ages fun with many benefits. Players can easily share performances on social media and even earn special highlight in the community area for being the most popular. Menu navigation is deeper, so it’s occasionally harder to find modes and options. The game definitely works to minimize navigation time that basically split between offline and online gameplay. Additional downloadable content (DLC) songs include “We Can’t Stop” by Miley Cyrus, “Funhouse” by P!nk, “Want U Back” by Cher Lloyd ft. Astro, “C’mon” by Ke$ha and “Kiss You” by One Direction plus many more on the way. Also available on PS3, Xbox One, Xbox 360, Wii U or Wii (the last Wii game release in North America). Just Dance Now ad-supported app was also released as an alternative version to the console version and works when connected to a TV, computer or tablet plus Chromecast. Just Dance Now, which is an ad-supported app version of the game available on Google Play and the App Store for a free download. No need for a console here, because players can connect to the game on a TV, computer, or tablet. This entry was posted in Video Game Reviews and tagged Just Dance, Just Dance 2015, Michael Siebenaler, Mike Siebenaler, Tall Writer, video games. Bookmark the permalink.